After having it own all my free time over the past couple of weeks, I finally finished Gyakuten Saiban 4, released in America as “Apollo Justice: Ace Attorney”. Now I’m able to go on with the rest of my life. I have a very short attention span when it comes to video games, and I often find myself losing interest within an hour of game play. But that has not been the case with the Gyakuten series. I have played each one of the four games from start to finish, wasting hours away reading text scrolling across the screen in front of static anime sprites. There is just something about the series that strikes a nerve among the otaku’s here in America, and it has become a huge success in this very unlikely market. Gyakuten Saiban, which roughly translates to “Courtroom Reversal”, started with a series of three games that came out on the Game Boy Advance system in Japan from 2001 to 2004. The story fallows Ryuichi Naruhodo, a hip young defense attorney, as he attempts to clear the name of all of this clients. Each game has 4-5 cases that usually starts off with a gruesome murder. All the evidents, however, always appear to point towards Naruhodo’s client. With the help of his cute and comical female assistant, Mayoi Ayasato, the two search for evidents and interview witnesses to ultimately prove the innocence of the accused. 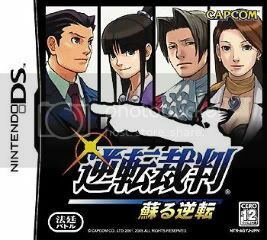 In 2005, Capcom released “Gyakuten Saiban – Resurrected Reversal” on the Nintendo DS. As the name implies, the game is a remake of the first Gyakuten Saiban game. The four stories that were in the original game remained in their entirety, but a new fifth story was created specifically for this version. The fifth story included many new gameplay elements the utilized the DS’s touch screen, microphone, and improved graphics capabilities. The biggest addition to the “Resurrected” version of the game was the inclusion of a complete English adaptation. The player has a choice of playing the game in either English or Japanese. For the adaptation, all the characters had their name changed to allow English audience to understand the bad puns of the original game. For example, while Naruhodo’s name is spelled with completely different Chinese characters, it sounds just like the Japanese expression for, “Oh, I see!” His English name was changed to “Phoenix Wright” to show how he always “raises from the ashes” of doubt to prove his client’s innocence. Also, several cultural bits were changed for the western audience, such as Mayoi’s (now renamed “Maya Fey”) love of ramen noodles was now a love of hamburgers. But besides for these changes, the story and gameplay remained intact. 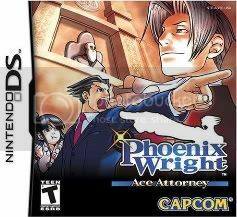 Capcom released this English version of “Resurrected Reversal” in the US under the title “Phoenix Wright: Ace Attorney.” This was a very risky move on their part. Gyakuten Saiban is a text-based adventure game. The player has very little interaction with the game and spends most of the reading dialog while watching the game’s characters move in very limited animations. The experience is more like reading a novel than playing a game, which is why the genre is often called a “Visual Novel”. Visual novels are very popular in Japan and take up 70% of the PC gaming market over there. However, they are virtually unknown in America. So for Capcom to put the time and effort into adapting the game for the western audience must have been a very a tough decision to make. Many, including myself, would have bet that it would be a complete flop over here. 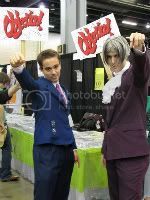 We were wrong, however, because Phoenix Wright quickly became a cult classic among the American otaku crowd. The initial shipment of the game completely sold out, causing Capcom to go back and make more copies. 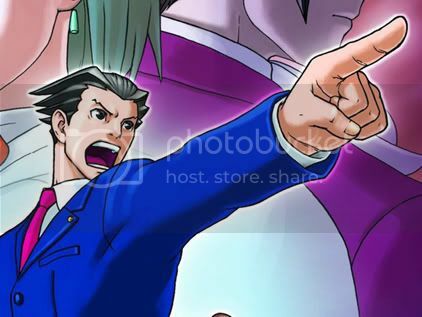 With a surprise hit in a very unlikely market, Capcom quickly adapts Gyakuten 2 and 3 into English and releases the in the US as “Phoenix Wright: Justice for All” and “Phoenix Wright: Trails and Tribulations” respectively. When I first played the English version of Gyakuten 1, I was a little disappointed. Unlike other Japanese visual novels, Gyakuten had a very linear storyline that would not progress until I made the right choices at the right time. There were particular situations that I had figure out the mystery and attempted to prove it, only to be penalized because I had to wait until later in the game to do so. And there were also many times when the story just had such a ridiculous solution that I had no choice but to select all my options until one finally worked. This game was just too frustrating to be fun! But then I came to that fifth story, the one that was created specifically for the DS. This fifth story allowed me to have more interaction with the evidence and play more “detective” than lawyer. I was able to rotate objects in 3D to search for clues. I did finger printing and forensics on the crime scene using the touch screen. I got to watch fully moving videos and spot clues on there. As is turns out, these small additions made the game a blast to play, and got me completely hooked onto the series. After that, I went through the pain-staking trouble of playing both Gyakuten 2 and 3 in both Japanese and English simultaneously. While this was completely unnecessary, I did enjoy getting to familiarize myself with the characters and their Japanese mannerisms. For example, I think that Mayoi’s younger cousin, Harumi-chan, was always much cuter in Japanese than she was as Pearl Fey in English. But still, those two games were only ports of the Game Boy Advance and did not have any fun elements that won me over from that “new fifth case”. That was because instead of adding additional content for the old three games, Capcom was devoting their time to creating a fourth Gyakuten game that was 100% made for the DS. Gyakuten Saiban 4 was released just under a year ago in Japan. The new game takes place seven years after the previous game, and surprising does not feature Naruhodo / Wright as the main character. This would prove to be very confusing in the American market, because the series is branded “Phoenix Wright” in America and you can’t very well make this “Phoenix Wright 4″ if he’s not the main character anymore. So the game was released in Japan without an English adaptation, and we had to wait for almost a year until Capcom released its re-branded “Apollo Justice: Ace Attorney” game in the US several weeks ago. But man, was it worth the wait! All the fun gameplay elements from that fifth case are back for the whole game this time. There are even some new gameplay features added and some fantastic looking graphics here-and-there. But most of all, the final chapter in this game introduces a completely new style of gameplay that will certainly blow the minds of many veteran players of the series. It’s these types of changes that keeps this series interesting even after all these years. 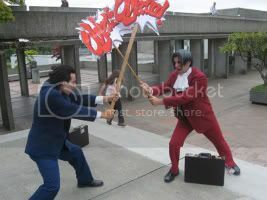 And even though he is no longer the main character, Phoenix Wright still plays a major role in the new game. I would even argue he’s in the game way too much. But it doesn’t really make much of a difference. 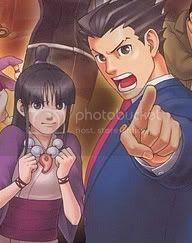 The new main character, Apollo, plays just like Wright did in the previous games and even sports the same kind of relationship with his cute and comical female assistant, Trucy. 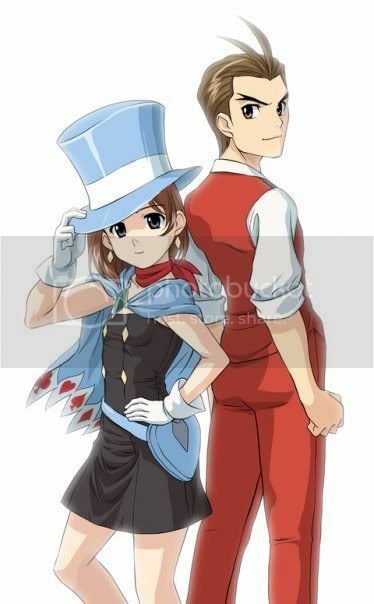 Trucy and Apollo become the new face of the Gyakuten series. So if you’re not on the Gyakuten bandwagon already, then get on it! All four game are now available in English in the US and you could probably find them cheap if you buy secondhand. A fifth game is expected to be formally announced by Capcom any day now, and I hope it includes the English adaptation right at the beginning. Also, Del Rey manga will be releasing the Gyakuten Saiban manga in the US starting in October, which follows the characters from the Wright-era of the series. It also looks like Del Rey loves the game just as much as I do, so I’m really looking forward to reading that. This entry was posted on Thursday, March 13th, 2008 at 6:18 pm by Scott	.